Picture by SANDY McCOOK Caley Thistle goalkeeper Cammy Mackay. 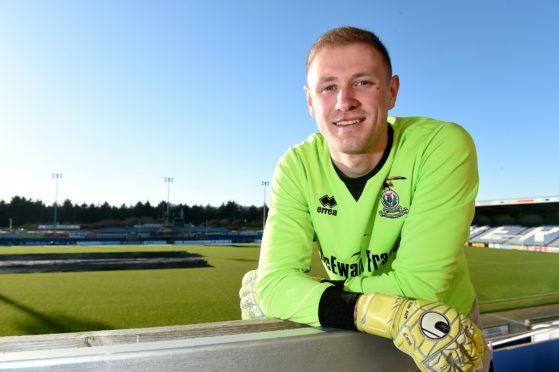 Goalkeeper Cammy Mackay not only has John Robertson to thank for his recent first team opportunity but also his earliest memory as an Inverness supporter. Mackay has recently stepped in to deputise for the injured Mark Ridgers, who has missed the last two matches due to a back spasm and remains doubtful for today’s Championship home match against Partick Thistle. Turning out for his hometown club is a huge source of pride for Mackay, who recalls celebrating Inverness’ maiden First Division title triumph in 2004 at the age of seven, during Robertson’s first spell in charge of the Highlanders. Mackay said: “Being an Inverness boy, it definitely means a lot – playing in front of a lot of people I know and with players I’ve played with for years. Getting that chance is huge for me. “Growing up, I always went and watched Caley Thistle. I watched them from a young age. The early one I remember most was when we got promoted the first time – I remember the pitch invasion. I was standing there with my mum and dad – who are season ticket holders here. “I was just a little boy and John was manager, first time around, when I was coming up through the youths. He would pop down to training now and again. Mackay has been understudy to the likes of Dean Brill, Ryan Esson and Owain Fon Williams as well as Ridgers, who has taken command of the number one jersey since joining from today’s opponents Thistle in summer 2017. The 22-year-old, who has had spells on loan with Elgin City, Brora Rangers and Rothes, feels he is reaping the rewards of his patience, having only made five previous Caley Jags appearances before being drafted in for last weekend’s 2-2 draw against Falkirk. Mackay added: “It is difficult as a keeper because it is only one place in the team. When Mark is doing as well as he is, it is going to be hard to get into the team. “It was good to get out to Rothes and just be looking forward to games on a Saturday. “But now it is really good, playing for the team I really want to be playing for. “There have been many times when I’ve wondered if the chance would come, especially last season with Ridgers fit enough to play the entire season. He was fantastic again. Inverness returned to fourth place thanks to Tuesday’s 3-2 victory over Ayr United, and Mackay hopes his side can continue to string victories together, adding: “Hopefully we can keep the momentum going. We’re up where we deserve to be. Through most of the season, the boys have been fantastic and they’ve just been unlucky to be drawing.